Chiyo-ni is arguably the most prominent haiku poet after Basho. Indeed, she is the woman haiku poet of all time. Chiyo-ni was born nine years after Basho died, in 1703, in the town of Matto. Matto is now a part of Hakusan-shi in Ishikawa-ken, and many of her works are held in the Matto City Museum. Chiyo-ni studied with Kagami Shiko, Basho’s disciple, and even as a child was composing haiku. She was very active in haiku circles, not joining any particular one. Haiku was, and still is, a social art. Haiku was composed in a circle of poets. Chiyo-ni was no different, and she created haiku with many others. Chiyo was her birthname, and she was called Kaga no Chiyo-jo, after the Kaga region where she lived. Her name changed to the suffix ni which means nun, when she took her vows as a Buddhist nun. She still retained the freedom to pursue her love and skill of haiku. Chiyo-ni’s activities are too numerous to mention here, and we refer you to this book. 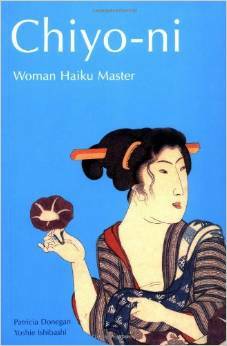 What is remarkable about Chiyo-ni is the life she lived devoted to haiku. Her road to spiritual awakening was the Way of Haiku. This entry was posted in Haiku and tagged Chiyo-ni on 2014/08/20 by Okunomichi.